Since its economic free-fall spurred from the collapse of the socialist trading system, Cuba has been embroiled in a ‘Special Per8iod in Peace Time.’ New pressures brought on by the search for convertible currencies have buffeted the Cuban economy (Mesa Lago 1994). The nation’s economic bind has placed ‘food’ at the head of the list of Cuban household needs, replacing the long-standing concern over housing. Despite some free-market tinkering with private food markets between 1980-1986 (Rosenberg 1986), the Cuban government scuttled market-regulated mechanisms for distributing, selling and preparing food. Recently, though, numerous food-preparation occupations and restaurants have been legalized (“Cubanos vuelven a tener paladares” 1995; “Cuba’s revolutionary restaurants” 1995; “Paladares” legalized 1995). However, there has be no in-depth investigation to date of Havana’s emerging food and paladar market. This paper examines one segment of the new food market— speak-easy restaurants called paladares 2— in an attempt to better understand the emerging market economy in Havana. Divided into four sections, I begin with the legal context and brief history of these growing neighborhood eateries in Cuba. The following two sections sketch profiles of these new entrepreneurs, and presents a brief case study of one paladar businesswoman. The fourth section considers the relationship between food prices on the black market, and the effect imposed by the recently sanctioned state agricultural markets. Finally, the paper concludes with some new observations about Havana’s emerging economic geography and the role of the paladares in Cuba’s transition to a new post-socialist economy. We begin with the legal context. The state rationing system of food and basic-household goods is inadequate in the Special Period. 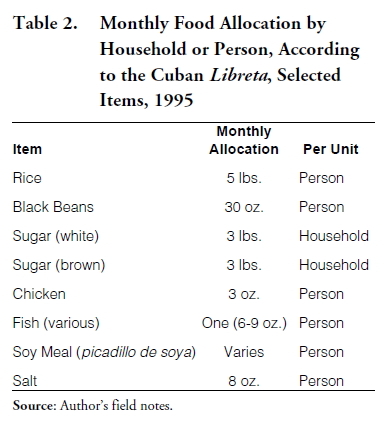 Rationing in Cuba is monitored by the booklet, the libreta (control de venta de productos alimenticios). Each Cuban household receives one for buying highlysubsidized products at local state food stores (bodegas). By law it must be turned in or modified i) within 10-days of the death of a household member, ii) hospitalization, iii) old-age institutionalization, iv) incarceration, or v) leaving the country. The libreta lists the age composition of the household by the cohorts < 2, 2-6, 7-13, 14-64, and 65 years and older. Non-food items normatively include fuel (kerosene, pre-heated kerosene, liquid gas, charcoal, firewood), laundry soap, body soap, cigarettes, rum and beer. Bodegas post prices on a chalkboard, along with the period in which the price is valid, and whether or not the product is available. In June 1995 I documented prices at a half dozen bodegas in the municipalities of Plaza de la Revolución, Centro Habana, and Habana Vieja. My aim was to determine which products had been available most of the time during that calendar year (Table 1). As can be seen, more items were generally unavailable, and the latter were not products of conspicuous consumption. Among those items available, most were allocated by temporal dimensions and strictly controlled portions. For example, each libreta allocates 5 lbs. of rice per person and just under two pounds of beans per person (Table 2). In brief, although the state system of food allocation is heavily subsidized and affordable even for households earning between 120-200 pesos monthly, it lacks variety and regularity. This penty up demand for alternative food sources. Fidel Castro announced the legalization of more than 100 private-sector jobs on the 40th anniversary of the attack against the Moncada Barracks. This date, 26 July 1993, marked the first of a series of market liberalizations which, among other reforms, sanctioned the dollar’s circulation, and proposed setting up savings and checking accounts in dollars. Paladares were also granted legal space to operate and their legal operators now form part of a larger private job sector of some 170,000 self-employed (CubaNews 1995c). The first round of paladares was short lived, however. In February 1994, a police raid on more than 100 paladares in the Havana metropolitan area ensued. Allegedly, police raided only certain paladares that were operating illegally. These establishments were accused of illicit enrichment. My interviews with more than a dozen paladar operators reveal that most of them had legal permits to operate. They claimed that the police harassed them and then stole and confiscated their wares. The indirect message to civil society, according to some restaurateurs, was that many operators were making too much money too fast. Because these were neighborhood-based operations, the word got out to Habaneros that conspicuous profiteering among the new entrepreneurial class would not be tolerated by the Cuban state. In May 1994 the penal code was amended to ease the prosecution of ‘profiteers,’ thereby giving the government ex post facto powers to confiscate assets and apply sanctions (Pérez-López 1995b, p. 27). Those same paladar operators stated that they were back in business anywhere from three days to three weeks later. Minister of Finance Manuel Millares Rodríguez and Minister of Labor and Social Security Salvador Valdés Mesa issued Resolution No. 4/95 on June 8, 1995 which once again ‘legalized’ paladares (“Resolución conjunta” 1995). In doing so, it eliminated the following self-employed occupations: producer of ‘light’ foods, processors of dairy products, maker of conserves that originated on a farm, and cook. The new law identified the tax payments each self-employed profession in the food-preparation business would make according to the size of the operation and whether or not alcohol was served (Table 3). Most of these self-employed professions pay a flat monthly rate (cuota fija mensual mínima). This flat charge is contentious because it requires a market forecast by the entrepreneur to determine whether she or he will in fact generate sufficient revenue to cover the monthly tax. Instead, all paladar owners with whom I have spoken would prefer to pay a sales tax that is based on actual sales. Those who charge in dollars must remit monthly quotas to the government in that same currency. My fieldwork shows that most paladares cater largely to Cubans, and charge mainly in Cuban pesos. No one I interviewed could identify a paladar operator who paid the dollar license fee; though an occasional tourist paying in dollars was always welcome, such revenue would not be reported to government officials. To situate these monthly fees by the purchasing power of an average salary, let us suppose a worker is earning 180 pesos monthly. The lowest monthly quota requires workers to put forth 55% of their monthly paycheck, merely to sell food and drink at the retail level. 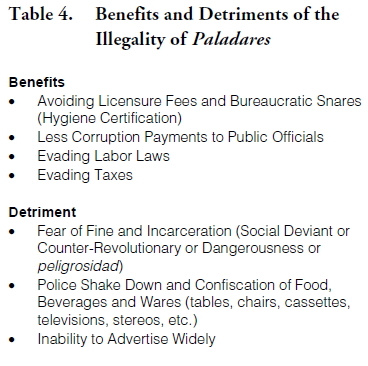 Most paladares fall under category c) in Table 3, “Preparer-seller of food products and non-alcoholic beverages through dining services.” In that case, they must place more than 200% of an average monthly wage ‘up front,’ to operate their family restaurant. The dollar-run paladar faces even stiffer start-up costs. At a monthly income of 180 pesos and buying dollars on the black market at 40 pesos per dollar (as of June 1995), means a prospective owner must invest nearly 67 months (about five and a half years) of wages into that business. Such an investment, though, would just cover the first month’s business tax. To be sure, overtly dollar-run paladares need to have direct access to capital in order to operate legally. Most likely, that hard currency comes from overseas remittances by family members. Other parameters in Resolution No. 4/95 shape the nature of the paladar operation. For example, there can be no more than 12 place settings in any given restaurant. Permanent residents of Cuba can also enter the trade. However, only family labor can be employed and it is illegal to hire by wage or salary nonfamily members. The law is vague about whether one can remunerate family labor. The kitchen, serving area, and private residences of each paladar must pass a sanitation inspection by the local Ministry of Public Health. Once the health inspection is approved and the license is secured, each restauranteur must sign up at the Central Business Register (Registro Central Comercial) administered by the Ministry of Internal Commerce. Those preparing food for retail sale are expected to sell their goods at cultural or recreational events, and only in public spaces designated for retail sale. All food providers— regardless of the currency they use or whether they dispense alcoholic beverages— must get their inputs at dollar-run state stores (diplotiendas), agricultural markets (mercados agropecuarios), or through their own livestock and private gardens. However, “in all cases [operators] are required to justify to the appropriate authorities the origin of the products used in their enterprise” (Article 7, Resolution No. 4/95). My sources claim that this is the legal loophole to close down any operator since only dollar stores give receipts for purchases on a regular basis. Paladar owners face other restrictions. They are forbidden to sell horse meat or beef, and shellfish and other fish which are illegal to catch. Owners claim that restrictions on horse meat concern problems of hygiene, aesthetics and the likelihood of increasing horse thievery in the countryside. The state targets tourism for beef production and those on special medical diets (the latter receiving food through physician-approved notations made in the libreta). Cuba’s yield of beef per head of cattle has deteriorated from 40 kg. to 30 kg. between the mid-1970s and 1988, the last date of available data (Figueras 1994, p. 69). Lastly, only milk purchased in dollar stores may be sold, and no food bought from state-run food stores (bodegas) or other restaurants 3 can be resold in paladares. Since 1992, I have visited 12 paladares on a regular basis, mostly as a participant observer, though sometimes as a customer. In a series of five focus groups over the past three years, I gathered in-depth information about the respective twelve owners. Ten of these 12 operators were female and half of the twelve had either been recently laid off, or else they gave up going to work because it was not worth their while to earn so little. The other half who were not previously employed were working mothers in the home (i.e., housewives). Each owner had an array of sources for their inputs. If the state-run agricultural markets (mercados agropecuarios, or los agros), in operation since October 1994, lack products that the owners seek, then they resort to the black market. All twelve have violated Article 3 of Resolution No. 4/95 which prohibits hiring non-family workers. At the very least, they required errand runners (mensajeros) to scout out an occasional food item at the market, or track down a lead about food availability or price on the black market. About half regularly employed someone to work in the kitchen while the host or hostess attended to the clients dining in the living room; if only to keep an eye on their own furnishings. As the apartments were fairly small, the clients were never out of the owners’ hearing range. A time consuming task during evening meal hours— the main period of activity— is answering the door by the frequent (Cuban) inquirers coming by to see what the evening fare was, and at what price. Echoing Hays-Mitchell’s (1989, 1993, 1994a, 1994b) studies of street vendors and small entrepreneurs in Peru, the paladar operators with whom I have spoken express satisfaction in the occupational independence that their job provides. Although only half of the twelve actually planned on getting a license for a paladar, those same individuals had already secured a license to prepare food in the home, but not to sell it in a restaurant-like setting. Each of the 12 vendors had at some time contracted cooks, messengers, and dishwashers, or else swapped kitchen labor for meals. Deciding to operate legally carries clear risks and benefits that operators must assess (Table 4). Concern about getting arrested for not having the proper papers has abated. The proliferation of private enterprise gives them ‘cover’ from prying government officials in this new free-market frenzy. Instead, operators’ main concern is screening out clients who look like they might not pay, or cannot show cash ‘up front.’ Operators never boast about their successes for fear of gaining the attention of prying government officials. Although an occasional tourist passes by and pays in dollars, the clientele is mostly Cuban. Several paladares can put out a ‘pleasant spread’ for the tourists, including fine dinnerware and a table cloth. A smaller group serves local rum and foreign distilled spirits as well as an array of Cuban cigars for after-dinner pursuit. Take-out orders are common; patrons either bring their own containers (usually a plastic tub or bucket) or use take-out boxes, plastic containers, or dinner ware provided by the owner. Three of the 12 had purchased non-descript cardboard-boxes— bought on the black market by suppliers who had stolen them from state warehouses— that could be assembled for take-out orders. The experience of one paladar owner and operator typifies the ways in which these new entrepreneurs assess market opportunities, perceive risk, and operate in Cuba’s unfolding free-market economy. Rosa (a pseudonym) entered this profession by default. At the age of 33, she found herself single, childless, and with a dead-end job at a state medical agency. Her work had not always been disappointing. Recently, though, it had been disrupted by changes in her work site. Up until quitting her job in May 1995, her job description had been changed five times because of government downsizing, a common force in driving Third World workers into informal and semi-legal occupations (Scarpaci and Irarrázaval 1994; Portes and Benton 1984; Portes and Borocz 1988). Her last reassignment entailed traveling across metropolitan Havana from her Vedado home. However, there was no bus service to that work site and she felt unable (or was unwilling) to bicycle such a long distance. When she did make it to work, often times there were no prepared lunches in the workplace comedor. Thus, like many Habaneros, she simply stopped going to work. Food shortages rise to dangerous levels in the hot summer months when workers are on vacation and school children at home stretch household ration books to the limits. Witness, for example, the 5 August 1994 riot on the Malecón seaside promenade which stemmed in part from a lack of food (Farah 1995). Rosa, though, stated she is pleased to be able to avoid the ‘no lunch’ sign at her workplace because her new trade keeps a good supply of food in her kitchen. Before quitting her steady job, she had prepared and sold a few meals on the weekends and evenings to neighbors, friends, and an occasional stranger who had a referral by a friend or family member. About a year ago, she secured a license to prepare confectioneries in her home; usually sweets, caramels, and candied fruits. They gave her— in her own words— a “legal pretext” to store supplies in her home. It also explained why callers come to her door at all hours should the authorities inquire about that. She told state officials that the license would be in her mother’s name because friends had said that the authorities tended to frown upon letting young workers move into these kinds of jobs. Any meddling or intervention by the authorities into her business, she feels, stems from the rapport she maintains with the local Committee for the Defense of the Revolution (CDR, Comité de Defensa de la Revolución). Luckily for her, Rosa has exceptionally good relations with the local CDR because she went to school with the son of the committee head. This echoes sociologist Francisco León’s (1995) observation that the Cuban ‘buddy system’ (sociolismo, or socio) may be just as important as credit, entrepreneurial skills, state approval, and marketing. She entered the paladar business ‘full time’ after deciding not to return to her workplace across town. At first, Rosa had no idea how to price her meals, and during the first month she lost money (in national currency). After securing a loan from a family member, she purchased more supplies and materials for her second month’s operation. Her goal was not only to ‘survive’ but to make repairs to the spacious, street-level apartment her mother had occupied since migrating to Havana in 1957 from Ciego de Avila. A friend told her that she should always try to make a 50% return on her investment. When asked how that figure was derived she said that she did not know, but that her friend had worked long and hard in selling second-hand wares. She simply trusted her friend’s judgment. After serving several meals on credit but never having the debt repaid, she imposed a cash-only business. Moreover, she now charges everyone for the meals. In the beginning, friends and neighbors would come around at the end of the night and chat. Later, she discovered that the real motivation was to see if there were any leftovers (sobras), or even passing a harmless comment like seeing if there was any burnt rice at the bottom of the pan (raspa); a treat among some Cubans. As a single woman, Rosa takes special precautions. First, she cannot depend on a steady income from a male partner, and wishes to save her money for emergency expenditures. Second, she refuses to sell alcohol except to tourists who come recommended by trustworthy Cubans. Alcohol, claims Rosa, breaks down semi-formal relations between her and the clients, and that can lead to trouble (e.g., sexual advances by male customers, people asking for credit, rowdy behavior, snooping police and CDR members). Third, she has a tendency to trust people, a value she claims was instilled in her by the Revolution. In the free-market, she argues, such trust can be a liability. Market forces fluctuated within the three months of a full-time paladar operation. In late June, 1995, business was down somewhat, as was the exchange rate of the dollar and the circulation of cash (pesos). Her market draws largely on two demographic groups: young, single adults in their late teens or 20s who tend not to work at full-time state jobs, but rather engage in casual work in the tourist industry. A second steady clientele— consisting of 20% of her gross sales — comes from single, elderly people who may not have sufficient fuel, cooking oil, or condiments to prepare meals to their liking. Since Rosa has all of the above and is known in the neighborhood as a particularly good cook, these elderly diners seek her out often. In return for their steady business, she lowers her prices by as much as 30% if she knows she can count on them. The elderly send younger neighbors or family members to pick up the meals. Rosa, moreover, refuses to buy processed foods such as frozen croquettes and makes all her meals from scratch. Food is not cheap in Havana for Cubans. For 10 pesos (only 25 cents U.S. but the equivalent of 5.5% of an average monthly wage of 180 pesos), a customer can take away a dish of congrí (rice and beans), cabbage salad (ensalada de repollo; lettuce is rare), and a vianda (potato, boniato [sweet potato], yuca [cassava] or ñame [yams]). Fish or meat— depending on the quality and quantity— almost always doubles or trebles the price, respectively. As Rosa learns more about pricing, client relations, and planning, she is able to increase her rate of profit. Her profit margins increase markedly when she can buy in bulk: rice, ham, chicken, eggs, and oil are perfect for wholesale purchases. Saving up enough capital is difficult. Her first recourse in securing inputs is from the municipal mercados agropecuarios. There are two such markets in every municipality of the Province of the City of Havana. Rosa likes to cruise the market stalls late in the day, right before closing time, hoping that vendors will drop their prices to make a last-minute deal. If she has transportation (a friend with a car), she will venture out to the large Cuatro Caminos market in Cerro, where the quantity and quality are more favorable than at the small market near her home. When the state markets fail to supply her, she turns to the black market. Some black-market providers are generic, and well known to all households. For instance, bakeries (panaderias) are state run but many individuals use them for buying vegetable oil, since they always have large quantities in stock. The purchasing and retail behavior of this aspiring entrepreneur deviate from the contours of a normative market economy. No mid-level and high-order wholesalers exist for her. Buying-in-bulk means striking ad hoc deals with individual retailers that do not pass on to her— in her words—“grandes ahorros” (i.e., economies of scale). Although large purchases help her out, they do not generate the discounts she would like to receive. Furthermore, it is difficult to map out the location of these and other paladares because they are so recent and because telephone directories and tourist literature do not list them. Before the present liberalization of the agricultural and food markets, Cuba tinkered with private farmer’s markets in the mid-1980s. However, like the paladares in their early months, these markets were closed because middle-men were thought to acquire too much wealth, too quickly. Thus, until late 1994, farmers’ produce had to be secured through tightly controlled state outlets (Alvarez and Puerta 1994). As of March 1995, there were approximately 1,479 agricultural cooperative units in Cuba, of which 486 (one-third) reported a profit (CubaNews 1995a). These cooperatives are permitted to sell their goods to the new mercados agropecuarios, though it is likely that two-thirds of those noted above are not meeting their state quotas (acopio)— a prerequisite for selling goods in the private market. For a variety of reasons, therefore, most cooperatives provide few inputs to Havana’s legal food markets. Paladar operators and other citizens who are unable or unwilling to seek fruits, meat and poultry, and vegetables through that outlet have no recourse but to turn to the black market. In this section we briefly visit some prices of commodities that prevailed in mid-1994, and then consider how the new mercado agropecuario markets have influenced the price of food products in Havana. Between 1992 and late 1994, I periodically monitored black-market food prices. 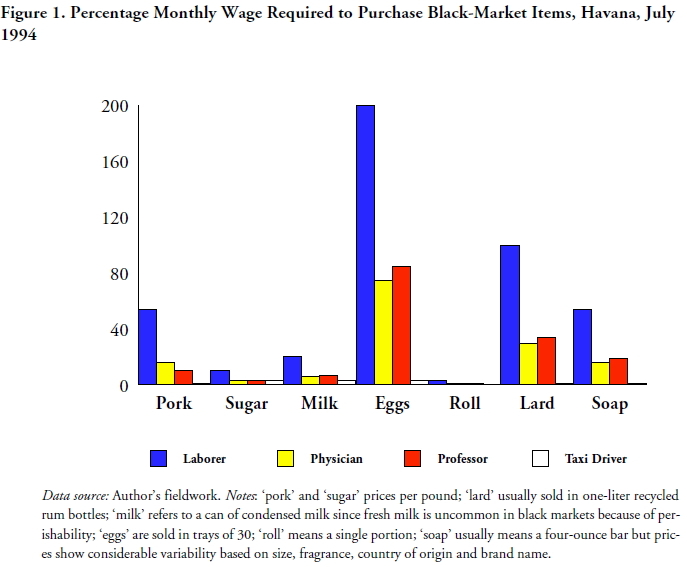 Figure 1 shows the purchasing power required to secure selected items on Havana’s black market according to four income scenarios: worker, professor, physician, and taxi driver. Significantly, all workers except the taxi driver are paid in pesos. Figure 1 reveals considerable variation in purchasing power. Perhaps the most controversial aspect for Cubans and foreign analysts is that the Special Period has placed material incentives on par with the traditional moral incentives that had driven the Revolution. A taxi driver, or any other Cuban formally or informally affiliated with the tourist trade (e.g., jinetera), has access to a wide array of basic foods and household products. A physician or college professor would have to sacrifice much to buy those items. For example, while a taxi driver would only have to spend about 1% of her/his wage on a pound of pork, a worker would forgo nearly half a month’s wage for the same item. Here lies a deep contradiction in the new market reforms, and one for which Cuban authorities have few patent replies. Put differently, the Cuban government has codified basic foods and household staples in a way that is not only unprecedented in the 36 years of the Revolution, but anathema to a social system based on common ownership of the means of production (Bradshaw 1991; Callinicos 1991; Forbes and Thrift 1987). Recall, however, that the above black market items prevailed before mercado agropecuarios were legalized four months later. As a result of this new source of food sales, black market prices have plummeted. In fact, in June 1995 I was unable to gather any consistent pricing on most of the items shown in Figure 1, though by June 1996 prices were much more stable. The only items not regularly sold in the new state markets are soap, milk, and bread products. In brief, the legalization of the agros has lowered black-market prices. However, this statement assumes nothing about the general population’s ability to acquire these goods. Both the decriminalization of dollars and the legalization of many black-market activities allows the Cuban government to resolve its foreign exchange problems (Pastor and Zimbalist 1995, p. 709). Una nueva estructura económica, más dinámica, más diversificada, menos dependiente de un solo producto, con un turismo internacional muy activo, cientos de empresas mixtas y asociaciones productivas funcionando y docenas de nuevos artículos manufactureros y agrícolas exportándose, puede ser el panorama de Cuba en los finales de este siglo (Figueras 1994, p. 181). Distortions in the paladar market stifle the kinds of multiplier effects we might envision in a less restrictive setting. At the national level, Cuba lacks what the Chilean business community calls transparencia: clarity about norms, regulation and information that is unrestricted by cumbersome regulation. Like de Soto’s (1989) description of pre-Fujimori Peru, state regulations hinder more than help Cuba’s fledgling cottage industry. At the service-delivery level, the case study of Rosa in this paper revealed that she is operating in an imperfect market that lacks economies of scale. No wholesaling inputs exist for her, and her inputs stem mainly from retail sources. While it is perhaps not surprising that the normative features of a market economy have not yet taken hold in Havana, future research should monitor the evolution of this particularly economic geography. In doing so, we will be able to situate Havana’s informal and second economies in a broader Latin American and Third World context (Pérez López 1995a; Rakowski 1994; McGee 1974). In the meantime, paladares — Cuba’s new speak-easy restaurants— provide operators with autonomy, the potential of increased cash flow, and a chance to exercise dormant business skills in a newly dollarized economy. Qualitative research of a small group of paladar operators reveals that state guidelines are both costly, onerous, and even unnecessary. As this new market takes form, unspoken rules, rumors and a buddy-system (sociolismo) play an important role in the decision-making process. Those constraints notwithstanding, paladar operators continue to search out low-cost inputs for their speak-easy restaurants. They face the same concerns micro-enterprises elsewhere must cope with: pricing, advertising, return business, buying in bulk, and access to credit. In this regard, this reservoir of a new business class plots along, building their firms, and incrementally improving their entrepreneurial learning curve. Paladar owners welcome their new-found occupational independence, and desire less of what the government wishes to impose over all self-employed: “greater discipline and control” (“Si de cuenta” 1995 ). Perhaps the only obstacle in their horizon will be a battery of new government guidelines should paladares — as past experience indicates— prove to be too profitable in the eyes of Cuban authorities. Alonso, J.F. 1995. “The path of Cuba’s economy to- day.” ASCE Newsletter, Spring – June, pp. 18-23. Alvarez, J. and Puerta, R. 1994. “State interventions in Cuban agriculture: Impact on organization and performance.” World Development 22:1663- 1675. Bradshaw, M. 1991. The Soviet Union: A new region- al geography? London: Bellhaven. Callinicos, A. 1991. The revenge of history: Marxism and the East European revolutions. Oxford: Polity Press. Cuba’s revolutionary restaurants.” Washington Post, 15 September 1995, A-28. CubaNews. 1995a. “Facts and Stats.” page 3 (July).
. 1995b. “Paladares legalized. : page 5 (Ju- ly).
. 1995c. “Private job list grows.” page 5 (July). “Cubanos vuelven a tener paladares” 1995. El Nuevo Herald. 15 June, p. 1-A, 9-A. Dávalos-Fernández, R. 1993. Las empresas mixtas: Regulación jurídica. Madrid: Consultoria Jurídica Internacional. de Soto, H. 1989. The other path: The invisible revo- lution in the Third World. New York: Harper Row. Farah, D. 1995. “Summertime, and Havana is un- easy.” The Washington Post, July 21, p. 23, 24. Figueras, M.A. 1994. Aspectos estructurales de la economía cubana. Havana: Editorial de Ciencias Sociales. Forbes, D. and Thrift, N. 1987. The socialist Third World: urban development and territorial plan- ning. Oxford: Blackwell.
. 1993. “The ties that bind. Informal and formal sector linkages in streetvending: the case of Peru’s ambulantes.” Environment and Plan- ning 25:1085-1102.
. 1994a. “Streetvending in Peru.” National Geographic Research & Exploration 10:354-365.
. 1994b. “Streetvending in Peruvian cities: The spatio-temporal behavior of ambulates.” Professional Geographer 46:425-438. Locay, L. 1995. “Institutional requirements for suc- cessful market reforms.” Paper presented at the ‘Cuba in Transition’ workshop, Shaw, Pittman, Potts & Trowbridge, Washington, D.C., April 10, mimeo. León, F. 1995. “Socialismo y sociolismo: Los actores sociales en la transición cubana.” Paper present- ed at the conference, “Toward a New Cuba: Leg- acies of Revolution.” Princeton University, April 8, mimeo. Mesa-Lago, C. 1994. Are economic reforms propelling Cuba to the market? Miami: North-South Cen- ter, University of Miami. McGee, T.G. 1974. The persistence of the proto-prole- tariat: Occupational structures and planning for the future of Third World cities. Los Angeles: School of Architecture and Urban Planning, UCLA. Pastor, M. and A. Zimbalist. 1995. “Waiting for change: Adjustment and reform in Cuba.” World Development 23:705-720. Pérez-López, J. 1995a. Cuba’s Second Economy. New Brunswick: Transaction Books. ASCE Newsletter, Spring – June, pp. 24-29. Portes, A. and Benton, L. 1984. Industrial develop- ment and labor absorption: A reinterpretation. Population and Development Review 10:589-611. Portes, A. and Borocz, J. 1988. “The informal sector under capitalism and state socialism: a prelimi- nary comparison.” Social Justice 15: 17-28. Rakowski, C.A. 1994. Contrapunto: The informal sec- tor debate in Latin America. Albany, SUNY Press. “Resolución conjunta No. 4/95.” 1995 Granma June 14, p. 2. Scarpaci, J. 1993. “Empowerment strategies of poor women under the Chilean dictatorship.” In M. Turshen and B. Holcomb, Eds., Women and De- velopment Policy in the Third World. Westport, CT: Greenwood Press, pp. 33-50. Scarpaci, J. and Irarrázaval, I. 1994. “Decentralizing a centralized state: Local government finance in Chile within the Latin American context.” Pub- lic Budgeting and Finance 14 (4):120-136. “Si de cuenta propia se trata…” 1995. Granma, 15 June p. 2.